Super Smash Bros. 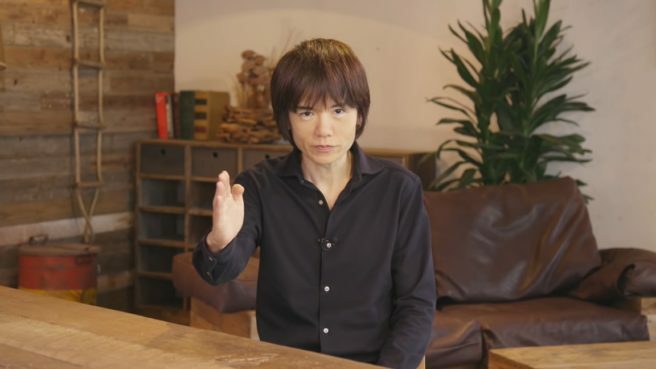 Ultimate director Masahiro Sakurai published a new column in the latest issue of Famitsu. This week, Sakurai talks all about game music, and what the process is like of choosing and including songs. Super Smash Bros. Ultimate has around 800 tracks that play during battles, and approximately 900 tracks in total. Given that the game is still under development, that number may possibly change; even still, though, that number isn’t anything to scoff at! And with the returning “My Music” feature, you can enjoy a variety of songs on any given stage at your leisure. The number of songs varies on a series-by-series basis, and often suits the given title. Every time we use a song from a guest series we have to shell out a lot of money for the right to use that song. It’d be difficult to acquire the rights to every song from every game, so – as we were only able to record a few songs for them – some titles might feel a bit underrepresented. Given those limitations, though, I feel like we’re doing our best with what we have for this Smash Bros. When it comes down to it, the amount of trouble we have to go through to acquire all those rights is dozens of times harder than would be in a typical game. There are a lot of composers whose work is in this game, so, I think I’d like to go into the actual process behind including their music! First, I sent each composer an email; that was about a year and a half ago now, so it was a struggle for me to tell anybody I was working on a new Smash Bros. game. Even still, I trusted them enough to give it to them straight. I sent a lot of the emails myself, but for some of the newer composers who would be involved I let members of the sound staff be my intermediaries. Once we had gathered about four to six people, we’d give a presentation about our plans. From there, we would explain to people affiliated with other companies or groups (like SEGA or Nintendo’s main development headquarters) the aims and main points of our plan. This time, more so than usual, we emphasized the “tension that battle stirs up” more than anything. It was at the Smash 4 invitational that I realized this. While I wanted to be able to get people excited through game’s music, I also included music like The Roost from Animal Crossing. Even if getting people pumped with that song was unlikely, I chose what I chose. If a song was good, I included it – that being said, I also tried to moderate things a bit and didn’t include things that didn’t fit the mood. After the composers had signed their non-disclosure agreements and we had finished explaining everything, we immediately set to picking out songs. We had created a database of thousands of contenders beforehand, but also gave a listen to songs that were suggested to us – from there, we would begin allocating and arranging songs. Each composer had their own personality: there were those that were able to immediately suggest a lot of songs at once, those that went home and thought on it, and even those that suggested their favorites from their respective series! We gave priority to the composers’ choices, so we might’ve been biased in our selection, but including well-loved songs was by and large the most important factor. Castlevania and Mega Man are particularly popular, so we included a lot of new arrangements from those series. One person in particular worked strangely hard on Fire Emblem’s music, so the number of tracks from that series increased as well. After we had picked the songs out, I left it up to the original composers from there. A lot of the back and forth was between the composers and the sound team, but I’d also perform checks here and there to make sure there was nothing that needed fixing. After all, I wanted the songs to suit Smash Bros. while retaining the energy of the original games they were from; in that way, some songs required a bit more direction. There are some songs that were listed but not selected for arrangement as well – those will be in the game as they were in their original games. There were some songs that we had absolutely no problem with, and some songs that didn’t fit as well as we thought they would, so those were some things for us to think about. … And that was how we settled on the game’s songs. All things considered, the best part was getting to work on such a large number of songs, each with their own history. I came to realize that “a masterpiece has no bad music!” Whether one enjoys a game or not is a matter of taste; even still, a game’s soundtrack carries an absolute “strength” with it – that’s what I think.